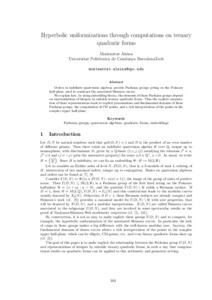 Orders in indefinite quaternion algebras provide Fuchsian groups acting on the Poincare half-plane, used to construct the associated Shimura curves. We explain how, by using embedding theory, the elements of those Fuchsian groups depend on representations of integers by suitable ternary quadratic forms. Thus the explicit computa- tion of those representations leads to explicit presentations and fundamental domains of those Fuchsian groups, the computation of CM points, and a rich interpretation of the points in the complex upper half-plane. Orders in indefinite quaternion algebras provide Fuchsian groups acting on the Poincare half-plane, used to construct the associated Shimura curves. We explain how, by using embedding theory, the elements of those Fuchsian groups depend on representations of integers by suitable ternary quadratic forms. Thus the explicit computation of those representations leads to explicit presentations and fundamental domains of those Fuchsian groups, the computation of CM points, and a rich interpretation of the points in the complex upper half-plane. Alsina, M. Hyperbolic uniformizations throught computations on ternary quadratic forms. A: Applications of Computer Algebra. "Proceedings of Applications of Computer Algebra. ACA 2013. Ed. : José Luis Galán, Gabriel Aguilera and Pedro Rodríguez". Málaga: 2013, p. 203-206.